Estimation of DOM based on a suitable regression of UVA on DOM. Measurement of organic precursors of interest in chlorination. Measurement of suitability for disinfection by UV treatment using UVT. Monitoring effectiveness of activated carbon filters. measuring effectiveness of water treatments to reduce organic load. This intrument is easy to use and is calibrated using DI water. Comes with mains power supply and car adaptor. 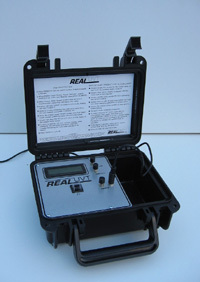 The UVT meter is a valuable and convenient tool for the water quality professional. For detailed information please follow this product link to the Real Tech website.